The sources of finance for a business are the capital that a business requires for expansion and other capital expenditure. Is is pivotal that the right source is recognized and pursued that matches the business requirement. There are many different sources that the business can recognize; they can be classified as internal and external sources of finance. The implication of sources of finance means an effect that the different sources might have on a business. A business always hopes for a positive impact, but on varied occasions and due to several other factors the impact might also be negative. These types of shares are issued to the proprietor or the owner of the company. The shares when liquidated must be equal to or more than the nominal value. There are different types of ordinary shares, namely deferred ordinary shares, new shares issues, rights issues, and preference shares. These types of stock are long-term stocks and need to be paid by the company over a long period of time. The holders of this stock are long-term creditors to the company and retain a fixed amount of interest usually paid quarterly or annually. The debentures are the most used form of loan stock. Some of the other forms of loan stocks are debentures with a floating rate of interest, security, and the redemption of loan stock. 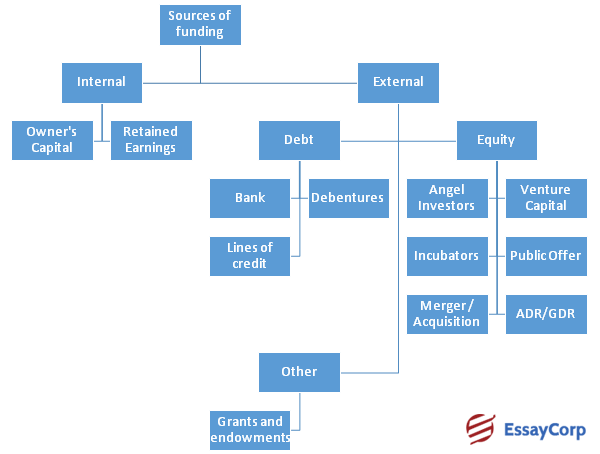 This source of capital is the revenue earned by the company which the company could use to pay off higher dividends to the shareholders, but the management of the company might believe that this form of capital does not cost to the company and therefore, they might follow this form of finance. The other reasons for choosing this method of financing can be – this form of financing avoids the issue cost; it prevents the change in control that could arise due to issue of shares; the shareholders may prefer to take capital profit rather than current income due to tax reasons. This is one of the oldest and the most important source of financing for the companies. The loans are generally short-term, but it is not uncommon if a bank lends a medium-term loan. The loans can be in the form of overdraft or a short-term loan that has to be repaid within three years. This is a form of renting where the ‘lessor’ owns a capital asset and gives it to the ‘lessee’ for a specified period of time and the contract requiring the ‘lessee’ to pay a certain amount as interest at a regular interval to the ‘lessor’. The two types of leasing are operating leases and finance leases. This is also a form of leasing where the ownership of the capital good is transferred to the hire purchaser after the final installment is paid; whereas, in the case of leasing the ‘lessee’ never gains the ownership of the capital good. As a part of the policy of the government it often helps to set up organizations or provide monetary grants to the company as a means to help the economy and eradicate or reduce unemployment. The government often bails out companies if they think it is going to benefit the economy; like the US government bailing out some of the banks that nearly collapsed during the depression of 2008. It is the investment made into a company which can be lost if the company goes bankrupt or suffers loss. A businessman while starting their business might require investment, more than they actually own and therefore a venture capital might be sought. The investor usually receives equity for their contribution to the business. This is the method of expanding the business without much investment. In this method of external sources of finance for a business the owner of the business allows some other entity to start a franchise by lending their brand name and they charge a certain sum of money. All the different business sources of finance have their own individual advantage that suits different company and for that reason they prefer that source. Some of the advantages are explained below. Trade credit is an important tool for some organizations to boost their financial growth. It is essentially the credit extended by the supplier that lets you purchase now and pay later. It helps the company maintain a healthy cash flow; it also allows the producer to sell the goods obtain the cash and then pay the creditors. Sale of asset is also an important source of business funding that is used by organizations. Effectively, if the asset is a property or something that is susceptible to price appreciation can help the business fulfill its short-term financial requirements. This is a good method of financing as the company can raise capital very quickly in a short period of time and help finance its short-term needs. There is no requirement of security for raising capital and the asset will eventually be owned by the business. Share issue is advantageous not just to the company, but also for the investor. Most large multinationals use this method of raising cash. The investors receive a share from the profit of the company, the investors are the part owners of the company, it helps the firm raise a huge proportion of cash. If the idea for the product is good and the future success of the product is guaranteed then this is a good way of raising a large amount of capital; it is also an effective way to expand the company. Loan or overdraft provided by the banks is also a traditional way of obtaining finance for the expansion of a firm. The process of obtaining finance through this method is very quick and eases the cash flow problem. It is a flexible loan for short-term to medium-term and a large amount of cash can be raised through this process. Government assistance or grants are the most beneficial, but very difficult to obtain as most of the power of approval rests with the government and the firm has to qualify many parameters to be eligible for this type of financing. Depending on the type of operation of the firm the source of financing must be adopted because every source has some advantages and some disadvantages; the best source must be found our weighing the risk and the opportunity. A SWOT analysis can be performed to come to the outcome. Following are some of the disadvantages of sources of finance for a business. Trade credit is disadvantageous to the company if the company has a bad credit history as obtaining credit in that case becomes very difficult. If the value of the asset has depreciated since it was bought that also creates a problem for the company because then the asset would have to be sold at a loss. The disadvantage with hire purchase is that an interest will have to be paid and the other disadvantage with this source of business funding is that the asset is not owned until the last installment is paid. The issue with share issue is that the profit of the company will be shared with the shareholders and the decisions cannot be taken independently as it must be based with the shareholder in mind. 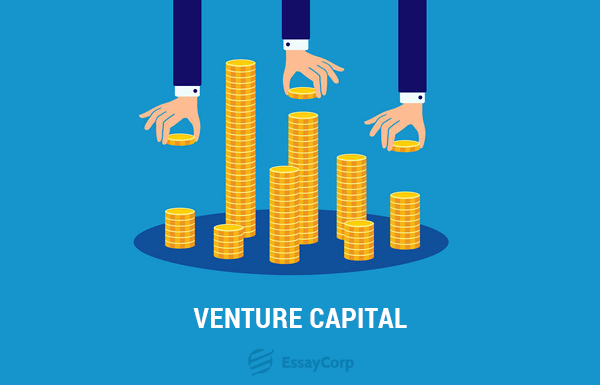 Venture capitalists invest huge amount of money in the business, but they also own a huge portion of the business and they will sell once they have acquired the maximum benefit of the investment. The sources of finance are very important for any organization; it helps the business expand and make more profit, but recognizing these sources is also essential as different organizations have different financial objective and a method that might suit one company might not fit the other. 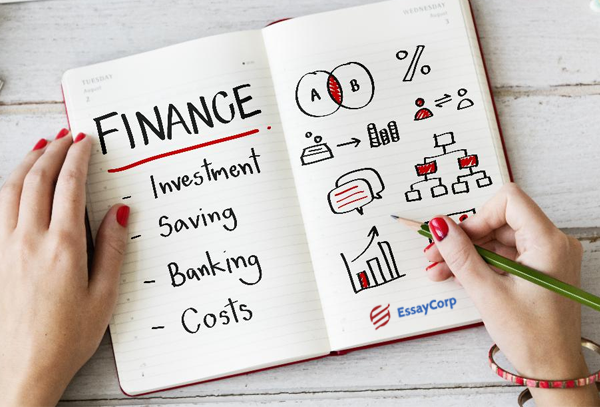 We at EssayCorp are experts at providing all kinds of academic assistance with this subject and other concepts of finance.